As one thinks of kitesurfing, it’s easy to picture a wide beach, palm trees and a beautiful turquoise ocean where colorful kites fly back and forth in the sky – an idyllic paradise. Personally, I’ve been kitesurfing for more than a decade. I have been around the globe and have seen many of these popular, and by media, acclaimed kite destinations. Some of these kite spots really deserve their stardom. Nevertheless, I think the media is missing one destination that might not have tropical warm water but, which is beautiful in many other aspects and truly great not just for kitesurfing, but for wildlife and tourism as well. I’m talking about Skåne, a county in the southern part of Sweden. In Sweden, kitesurfing is popular along the coastline. The problem is just that large parts of the coast are lined with rocks, cliffs and, forests. As a cherry on the cake, the water is often also choppy and gets deep once you step into it. Fortunately, the west coast of Skåne is blessed with sandy beaches, grass and, shallow waters. 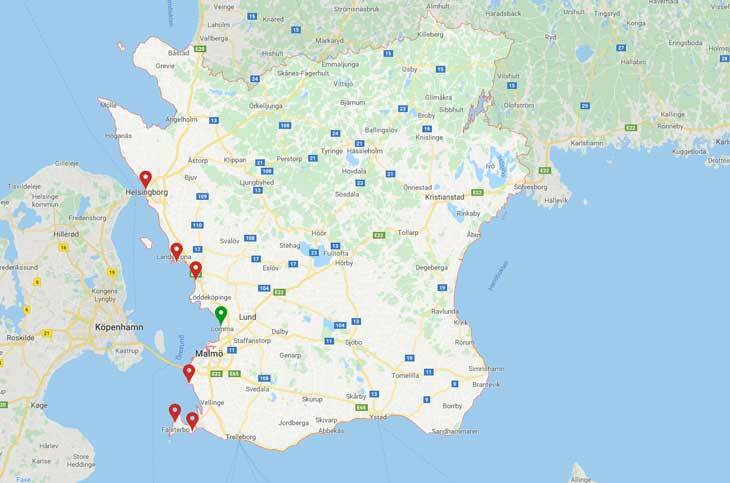 At a distance of 100 kilometers, starting from Falsterbo up to Helsingborg, you’ll find a dozen kite spots with their own characteristics. Some spots are located very close to each other why not all spots are marked on the map. These spots vary in its surroundings and conditions. In Falsterbo for instance, the very south part of the map, you’ll find gorgeous beaches and nature reserves, but with relatively deep water. Further north is where you find the flat water spots with shallow water. One of these spots is called Habo Ljung, marked with a green pin. Habo Ljung stands out in many ways and, which, in my humble opinion, outclass many of the most popular kite destinations in the World. Let’s look closer at Habo Ljung and why it’s ideal for beginners as well as advanced riders. Habo Ljung is a flat water spot of world class. The water level varies a bit depending on currents and winds, but it’s usually very shallow. It’s first when you are about 250 meters from land as it starts to become deeper, so if you’re looking for flat water then simply just stay closer to the land. Small sandbanks that work as natural wave breakers are common. The water behind these sandbanks is of course super flat, but still deep enough for one to not hit the bottom if you crash. The bottom itself is very fine and consists of soft sand. At the most, you’ll find tiny shells, but you don’t have to worry about rocks, sea urchins, sharks, stingrays and other unpleasant things that you usually find at many other kite spots around the Globe. Habo Ljung is ideal for southwestern to northwestern winds. Straight western wind works fine too, but you might end up crossing a lot against the wind with straight onshore wind. You’ll find the absolute best days for kitesurfing in Habo Ljung when the wind starts hauling after a few windless days. The water level rises relatively fast when the wind presses the water towards the land, why the water eventually will become a bit deeper and choppy after some windy days. 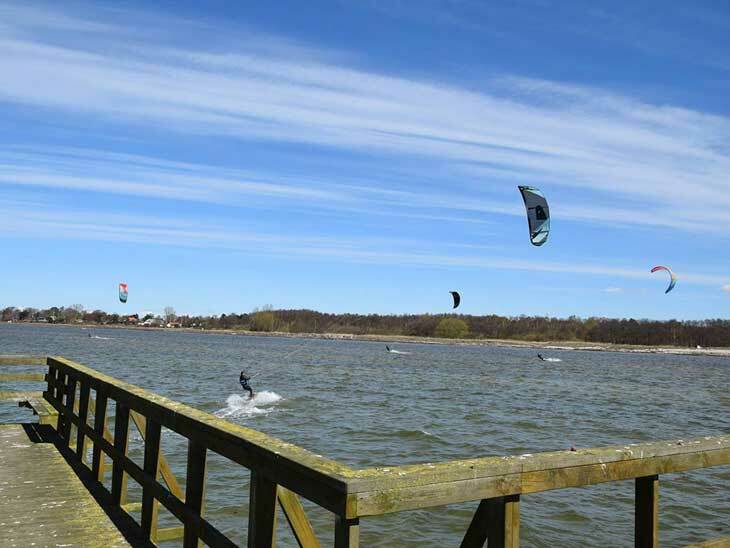 The kite spot at Habo Ljung is perfect both for beginners and more advanced riders. Internationally Habo Ljung is by many still an undiscovered gem, but the rumor is spreading, why more and more kitesurfers visit Habo Ljung during the summer, often to camp and kitesurf. A few kite schools operate at Habo Ljung so if one would like to take a lesson or two he or she should consider the opportunity to attend a course and learn to kitesurf in these excellent conditions that Habo Ljung offers. A camping site is located right at the kite spot, so all you need as a tourist is a tent or a campervan to be able to enjoy both inexpensive accommodations and with, literally speaking, creepage distance to the beach. There is a high amount of camping guests that dwell on the camping site and on the beach during its peak season, starting the 15th of June and ending the 15th of August. The rigging area is during the peak season therefore limited to a smaller area on the beach since the lawns are reserved for camping guests. The area on the beach is nevertheless still big enough not to get too crowded when you rig, land and launch your kite. Other advantages with Habo Ljung are the fact that there are toilet facilities, a cafe and a parking lot. Public transport is well-developed in Sweden so getting to and from Habo Ljung as well as to other kite spots is usually without problems. A long pier stretches 200 meters out from the beach, the perfect sideline. Kitesurfers can ride both on the north and south side of the pier. Kitesurfing in Skåne is indeed an experience you’ll remember for life. 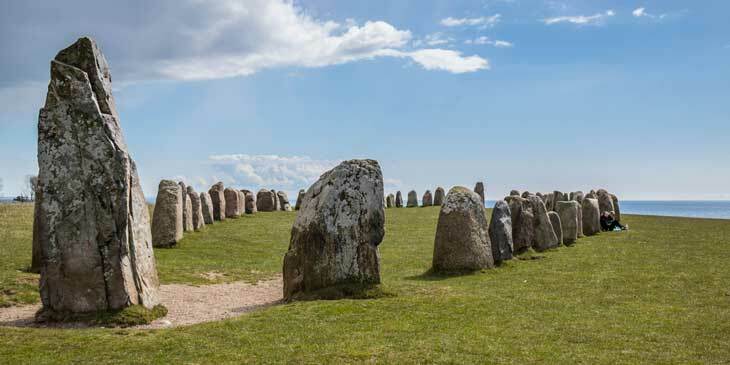 Skåne offers much more than just great kitesurfing spots. The landscape is, compared to the northern parts of Sweden, open and you won’t see much of the dense forest that cover large areas of the country. 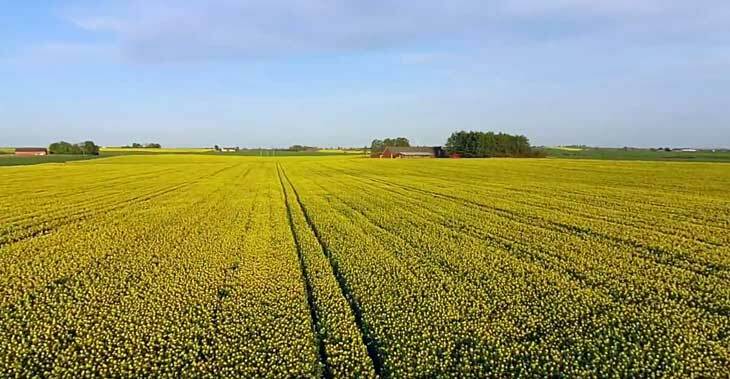 Instead, the typical view when you gaze over the landscape, are occasional mills and farms surrounded by cornfields and yellow colza fields. There are however several nature reserves where you also can find old forests. Do you seek tranquility at the ocean, in nature and, in small cozy towns? Skåne is the Swedish county where you will find all this within a reasonable distance. As the author of this article and as an inhibitor in Skåne for more than 20 years I’d say I know the county pretty well by now. I love doing daily trips and I do of course have my favorite spots, so I thought I’d share my top destinations and activities in Skåne that can be covered by a car on a summer day. First things first. Start off your early morning with freshly brewed coffee and a healthy breakfast in a sunny garden. If you don’t have the luxury to stay in a house or an apartment where you can prepare your own breakfast then I can assure you that there is no shortage of cozy cafes in Malmö or Lund where you most likely will stay as a tourist. Next, point your GPS to Kåseberga, a small coastal village located in an area called Österlen. Kåseberga is famous for its ancient monument called Ale’s Stones. This monument was built in the 17th century. This incredible stone formation is placed close to a steep ledge where the sea meets the sky and nature. The sensation of being here is just magical! It’s recommended to be there early since it’s a popular destination not only for tourists but for Swedes as well. In case you start getting hungry by now then don’t worry. You’ll find a smokehouse in walking distance from Ale’s Stones where they serve delicious fish. The next stop on your day trip is Falsterbo, a foreland located about 30 kilometers southwest of Malmö, Skåne. Falsterbo is a, part from the inner city, a big nature reserve and the place I go to when I feel for a long peaceful walk along the beach while observing birds which biodiversity is high in this area. The beach stretches several kilometers why the beach people usually are quite spread out. Finding an empty part of the beach is never a problem if you seek some privacy and perhaps to go for a skinny dip. If you skipped the smokehouse in Kåseberga, then you’ll get another chance in Skanörs harbor which connects to Falsterbo. If you don’t fancy fish, then there are also plenty of nice cafes and restaurants in the city area. Falsterbo is also a spot where you can kitesurf. Let’s pray for some wind for our final destination, Habo Ljung! Even though the day so far has been windless there is a fair chance for an afternoon breeze. The worst case scenario is that you’ll end up watching the sunset instead of kitesurfing, but hey there is a day tomorrow too! Please share your best kitesurfing spots in Skåne in the comments below, on Twitter, Facebook or Instagram. Happy kitesurfing!